Light, Energy and Information Transference©, Celestial Healing Therapy©. Reiki. Testimonials. This is a Specialised Experience for the individual who has reached the level required, through their Earthly Journeying, to be able to fully integrate their Physical Self with their Expanded Self (Higher Self). The initial session will be an assessment followed by a primary Light, Energy and Transference© through our mutual Energy link whilst you are resting on the therapy couch. There will be an opportunity for discussion before and after the session to clarify the experience and to discuss developing further sessions toward full integration, or as far as you wish to proceed. The design of each session will be straightforward, easy to understand and assimilate. Energy Healing and other aspects of the Healing Process may be included in order to repair or boost any areas of the total body systems (body, emotion, mind, spirit, past lives etc.) in order to enable you to receive, and be fully prepared for, the re-empowerment and re-membering of Who you Really Are. This process enables you to begin the process toward fully standing in your Power. Then to integrate your Physical Presence with your Divine Essence, thereby revealing your True Self in all its Beauty and Magnificence. Having achieved this level, which is that of Ascendency and Enlightenment, you will then have fulfilled all your Intentions in being here on Earth and completed your Earthly Incarnation Cycles. 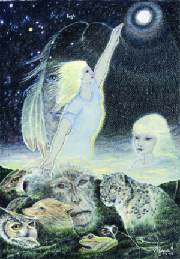 You will be free to complete your unique Divine Commission given to you by The Source for this Incarnation cycle in your own time in your own way. You will be free to fully enjoy your Presence here on Earth in all its Glory, De-light and Joy! Express Who You Really ARE whilst Being Fully human! The fundamental objective of ALL human beings! And the reason behind you choosing the Earth-based Incarnation Cycles! This very powerful, effective, and gentle Healing Therapy system has been created and developed by Virginnia through many years of experience working with Energy both Spiritual and physical. Celestial Healing Therapy© works with the Highest Energy including the Angels, Ascended Masters, and High Dimensional Beings, and, most importantly, YOU! This Therapy involves connecting with the source of any pain, dis-ease, illness, distress, stress, or imbalance in any part of your Being that you may be experiencing. In this way you will receive the most appropriate healing Energy during the Healing so that you may regain energy, balance, and good health physically, emotionally, mentally and in Spirit. You are also offered strategies that are very straightforward, practical, and supportive, to help you to maintain good health and to gain greater confidence in your personal power in choosing the life experiences you wish. Celestial Healing Therapy© is designed to help you to feel full of vitality and be more able to move forward in your life with a greater understanding of, and insight into, the ‘How’ and ‘Why’ of your experiences. Celestial Healing Therapy© is completely safe, effective and powerful.It is totally compatible with any other treatment or therapy. Ideal for physical and aetheric energy healing. "....about the improvements I've noticed. It is a difficult thing because you just feel better, and don't really think about it, because it seems so natural. I am feeling lighter somehow. It was a real effort to do anything and now that seems to be completely different.Also, a really good thing is I have noticed is my relationship with my difficult son. Before, I had created an emotional barrier between us for many reasons....I found that I avoided talking to him or got my husband to answer the 'phone as I was barely able to string 2 words together. Since our last session I have spoken to [my son] on the 'phone and by e-mail, and I feel really different.....Since I saw you the first time the overwhelming sadness I felt about [my son]....seems to have been released - thank you! You are brilliant!" "I met Virginnia about two years ago and have had approximately 6 healing sessions with her over that period of time. She has a 'unique' healing sanctuary and on my first visit was completely overwhelmed by the amazing energy as she opened the door and invited me in. During the healing sessions I have experienced the most incredible journeys which have had a great impact on me. She took me to a place where I belong which for me was beautiful. She has the most amazing healing skills which leaves you with an astounding awareness of yourself. I would thoroughly recommend her." "I have been having healing sessions with Virginnia for some months now. Virginnia is an amazing healer and has a wonderful connection with Spirit. Everytime I have healing I am given exactly what I need in order to bring mind, body, and spirit into greater wholeness. Recently I have had a couple of situations where I could not see Virginnia and she sent me some Distant Healing. On both of these occasions the resulting healings were extrememly powerful and exactly what I needed. I cannot speak too highly of Virginnia's ability as a healer. I would personally recommend her to anyone." "I would just like to say something about Virginnia, I met Virginnia several months ago, I attended one of her workshops which was fascinating, I also had a healing session with Virginnia, which left me feeling fantastic, energised and pain free."